Poblanos are used in this recipe, but if you prefer a milder taste, use bell peppers. Place cast-iron skillet (or baking pan) in oven, heat oven to 400°F. Quinoa Rinse quinoa before cooking to remove a coating that can cause a bitter flavor. I use the saucepan I’ll cook it in and a strainer. Swirl it in the water, drain, rinse, drain again. In a small saucepan heat water to boiling. Stir in quinoa. Cover pan and reduce heat to low. Cook 12-15 minutes, until quinoa is cooked and grains unfurl. Remove from heat, drain excess water, return to pot, stir, cover, set aside while you assemble the other ingredients. Filling In a large bowl, stir together chipotle pepper, beans, corn, tomatoes, cumin, salt and cayenne pepper. Add quinoa, stir together. Cut poblano peppers in half lengthwise, from stem to end. Remove seeds. Spray skin side lightly with cooking spray. 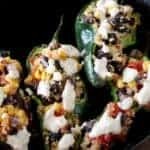 Fill poblano peppers with quinoa mixture. Place in hot skillet or pan. Bake 25 minutes. Remove from oven. Drizzle with lime crema. Lime Crema Stir yogurt, lime juice and zest and chile powder together. This recipe uses half a can of fire-roasted tomatoes. You can substitute regular diced tomatoes. The remaining tomatoes can be frozen or make a roasted tomato vinaigrette.